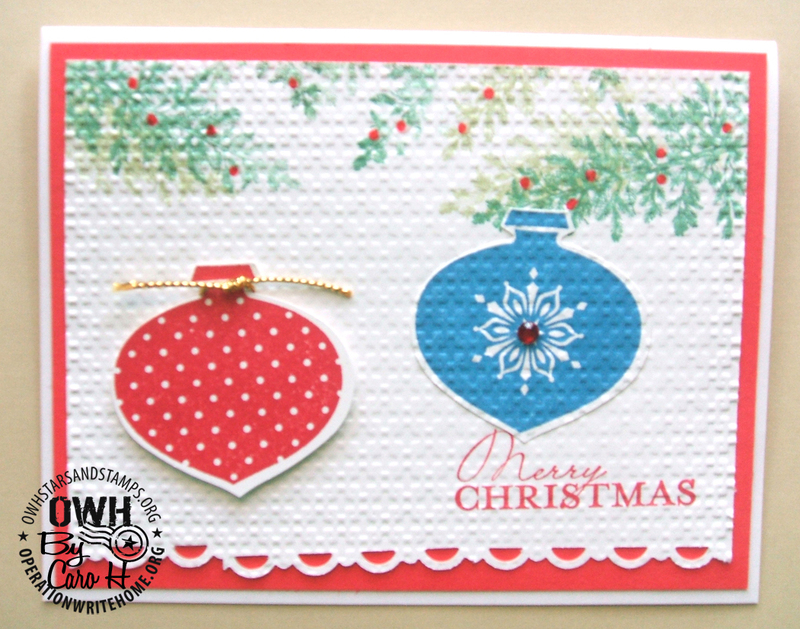 In case the arrival of the holiday season has kept you so busy you’ve missed it, OWH has a new East Coast shipper. Caro, lives a few minutes away from Dixie, and has been doing intensive training with her, she has taken over duties officially as of Thanksgiving. Be sure to make a stop over at Dixie’s blog “What’s Next” to thank her for her dedication and hard work on behalf of OWH. My husband was deployed in the Navy in the Indian Ocean in the ’70s with port calls in Bangladesh, Sri Lanka and other remote places where there were no cards, internet and often few phones to keep in touch with loved ones. So many friends are veterans and many of my college friends sacrificed much in Vietnam. Sending cards to help our current heroes keep in touch with home is the least I can do to thank them for their service. Taking on the job of East Coast shipper is just taking that to another level! Caro you are MARV-E-LOUS! Your cards are awesome! I love the name of your town. My favorite card is the two little girls! I just remembered that in your text you said "retired" – working as a shipper can't possibly mean "retired"! Welcome! Really like the church card…great image and distressing. Thanks for sharing! 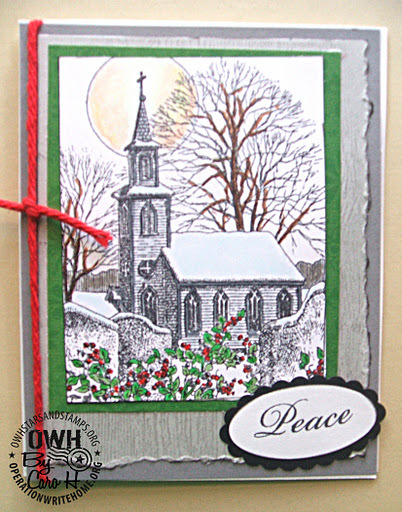 It's hard to pick one favorite by I like how you used the yarn and the beautiful coloring of the church image. 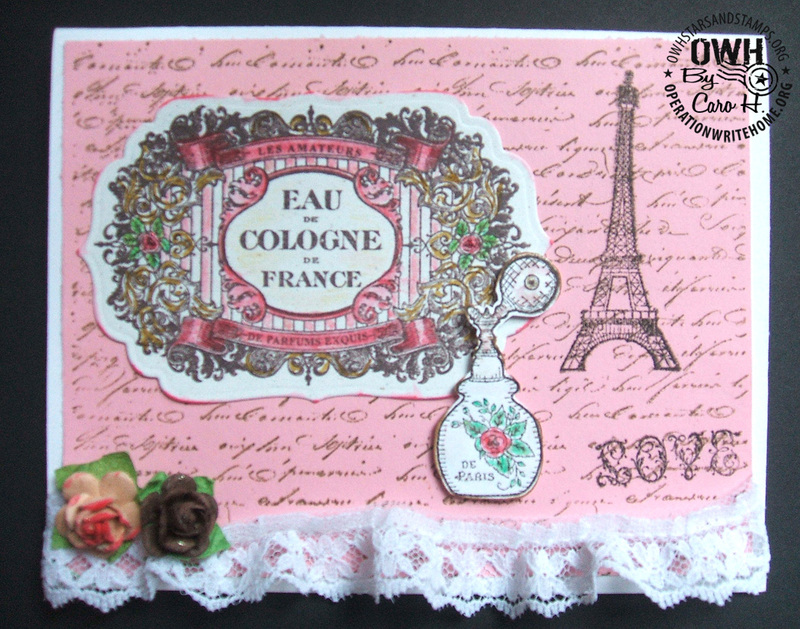 And that lace, the images and color combo on the Paris card… Ooo La La! and or course that sweet Maggie's in the Santa hats are adorable. 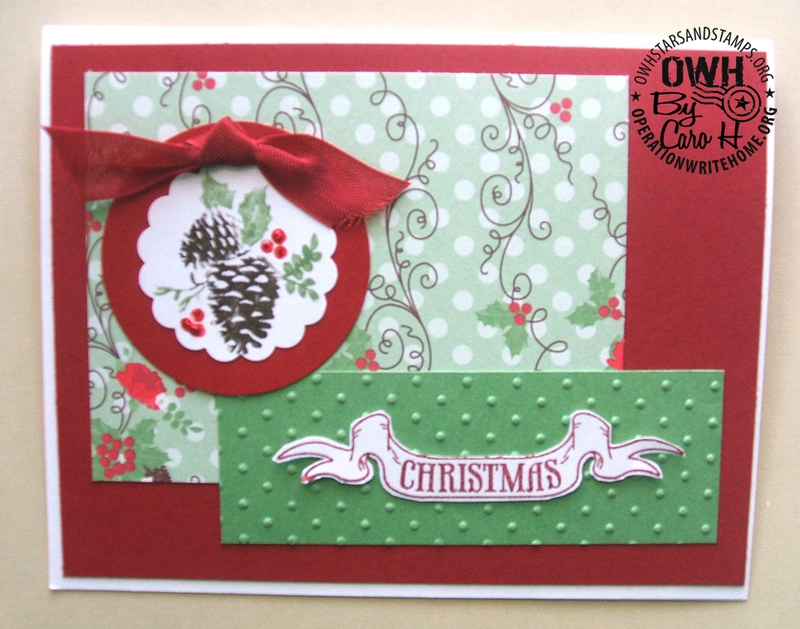 Thanks for sharing your cards this week and for coming on board as the new East Coast shipper Caro!